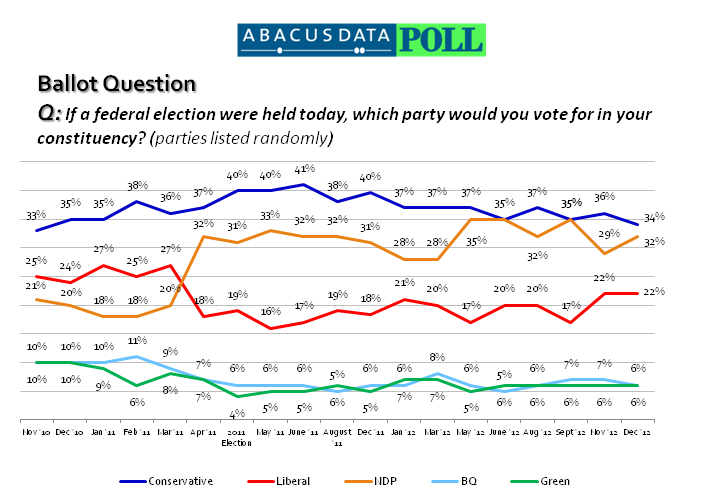 According to a new national survey from Ottawa-based Abacus Data, the Conservative Party of Canada’s seven point lead last month over the NDP has been reduced to two points nationally. The Conservative Party has the support of 34% of decided voters ( -2 since November) compared with 32% for the NDP (+3 since November) and 22% for the federal Liberal Party (unchanged). The Bloc Quebecois and Green Party support was at 6% each respectively. This is the lowest level of support for the Conservative Party since Abacus Data’s first national poll back in November 2010. Since last December, the Conservative support is down six points (40% to 34%). Regionally, the Conservatives lead in Alberta (63%) and in Ontario (38%, down 5) while the NDP is ahead British Columbia (43%). In Quebec, the NDP is once again ahead of the BQ after a decline in the province last month. The NDP has the support of 39% of decided voters in Quebec followed by the BQ at 25%, the CPC at 17%, and the Liberals at 16%. The Conservatives continue to lead among men (37% CPC vs. 31% NDP) while the NDP has improved its standing among women since November (+6 to 34%). Among different age groups, the NDP has a 24-point lead over the Liberals among those under 30 while the Tories have an 21-point advantage among those aged 60 and over. The Tories and NDP are competitive among middle-aged voters. 42% of Canadians surveyed believed that things in Canada are heading in the right direction while 43% believed things are headed in the wrong track. This is a significant change since November and a return to findings found before November where the tracking saw a significant optimism boast following Barack Obama’s re-election in the United States. Those living in Alberta were most likely to think the country is headed in the right direction (67%) while Quebec respondents and those living in BC were less likely (Quebec 33%; British Columbia 36%). The federal government’s approval rating has weakened marginally this month. Overall, 37% of respondents approved (-2 since November) of the job performance of the federal government compared with 47% who disapproved (+3 since November). Tom Mulcair’s personal ratings remained relatively stable since November. One in three Canadians said they had a favourable impression of the NDP leader while 24% viewed him unfavourably. Prime Minister Harper’s personal numbers were exactly the same as those registered in November with 35% of respondents saying they have a favourable impression while 46% said they had an unfavourable impression of the Prime Minister. As 2012 comes to a close, the federal political opinion environment remains in a state of flux as the Liberal Party has yet to select a permanent leader to replace interim leader Bob Rae. Nonetheless, Conservative Party support is down to its lowest level in over two years of Abacus Data tracking while the NDP and Liberal Party ending the year higher than when it started. Much of the support the Conservative Party attracted to win its majority in 2011 has receded and disapproval with the government and impressions of the Prime Minister remain constant and negative. The NDP continues to be the alternative for many Canadians but its support may quickly recede as impressions of Tom Mulcair are soft and underwhelming. The Liberal Party has rebounded from earlier polling lows yet continues to poll poorly in Quebec, British Columbia, and Alberta. These three factors indicate that the candidacy of someone like Justin Trudeau could fundamental alter the political landscape as a volatile and uneasy electorate looks for a candidate and a party that offers it something different. Justin may not save the Liberal Party but the political conditions are so that the enthusiasm and dynamism he would bring to Canadian politics could have a profound impact on voting intentions and political attitudes in 2013. The survey was conducted online with 1,505 respondents in English and French using an internet survey programmed and collected by Abacus Data. A random sample of panelists was invited to participate in the survey from a panel of over 150,000 Canadians. The survey was completed from September December 7 to 8, 2012. The margin of error for a probability-based random sample of 1,505 respondents using a probability sample is +/- 2.6%, 19 times out of 20. Note: an oversample in Ontario was also conducted surveying a representative sample of 810 Ontario residents aged 18 and over. The Ontario sample was weighted according to census data to ensure that the sample matched Ontario’s population according to age, gender, education level, and region.